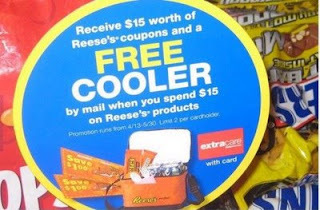 Spend $15 on Reese’s products at CVS through 5/30/09 and receive $15 worth of Reese’s coupons and a FREE cooler by mail. The spend $15 is before coupons. Look in your 5/3/09 SmartSource inserts for $.75/1 or $1/1 (not all area got these) coupons. Limit 2 per card.